Exeter based office fit out specialists MD Business Interiors often get asked about sound. Many businesses move without giving it any thought. Here are some ideas and thoughts on the matter. Office based staff can have enormous difficulties coming to terms with the sounds that form the backdrop to their working day, especially if they work in open plan areas. The problem with these kinds of working environments are particularly acute because most UK employees now work in open plan offices and at workstations that are on average about a quarter smaller than they were ten years ago. The underlying love affair with open plan offices is unlikely to be broken off any time soon. Not only is open plan generally more conducive to communication and less bound by ideas of that great contemporary no-no that we call ‘status’, it takes up around half the space of cellular offices. In addition, the costs of fitting out a cellular office are around 25 per cent higher than an equivalent open plan space. So little wonder that open plan offices will remain the standard form of most British workplaces. That is not to say that open plan offices are perfect as one problem appears to be the lack of privacy they provide. The problem has been exacerbated recently by the trend to fit more and more people into offices, something that has become possible with the advent of new working practices and the ubiquity of flat screens and laptops. The lack of privacy in open plan offices can be sometimes be a problem. 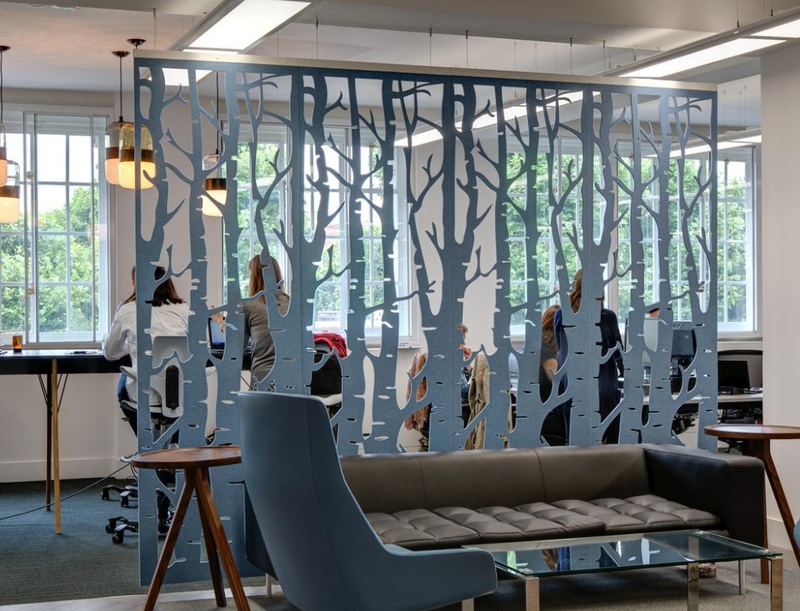 We are aware of some of the distracting effects of noise the cost of space but the contemporary focus on team working dictate that the open plan is here to stay as the norm for most of them. Fortunately it is possible to reach some sort of balance between the often conflicting need for us to work in privacy but also communicate as part of teams. Problems and solution arise first at an architectural level. 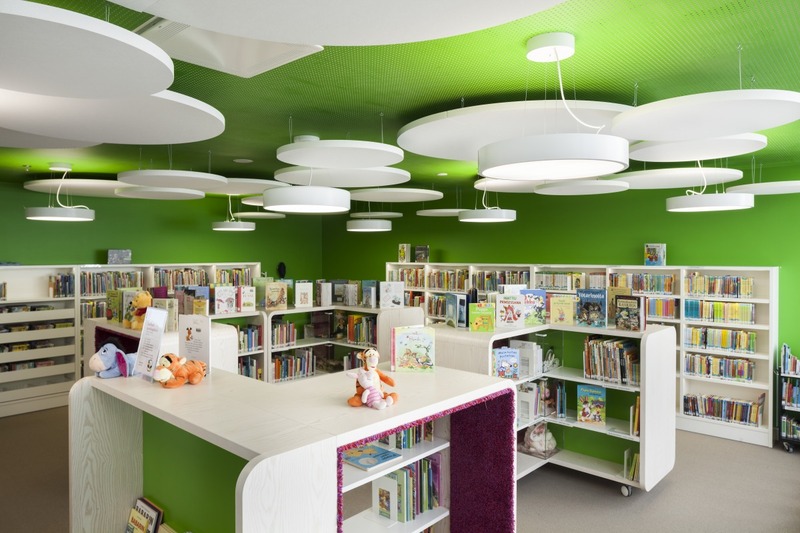 Sound is prone to bounce off ceilings and follow sight lines so the way a building is designed can have a significant impact on noise levels in its interior. The type and shape of a building is often beyond the control of the organisations that inhabit them so, regardless of its architecture, there are several basic elements to address to deal with problems of noise in a building, including ceiling systems, sound masking systems, systems furniture, flooring and interior design. Design is becoming increasingly important as firms reduce the amount of space they allocate to people in the office. Smaller flat screen monitors have helped the average workstation to shrink by over 25 per cent in the last few years, saving space and money but with the potential for counter-productive cramming. 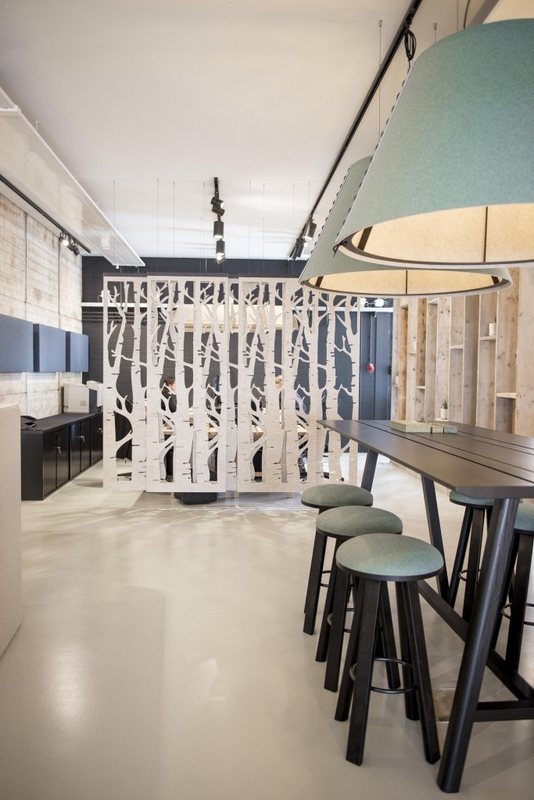 Then again, some organisations are actively looking at alternatives to workstations for some staff, creating offices that have more in common with cafes and clubs than traditional offices. High performance ceiling products with significant articulation class (AC) ratings and noise reduction coefficients (NRCs) are readily available. AC ratings determine how well a ceiling reflects sound. NRCs determine how well a surface absorbs sound. It is also important to avoid HVAC and lighting elements that can act as reflectors of sound. Sound masking systems generate a level of white noise that helps to minimise the disruption caused by speech and sudden or ‘impact’ noises. All furniture will absorb some level of sound, but screens and partitioning is by definition particularly effective. Properly specified, such ‘interior architecture’ may absorb around 85 per cent of ambient, intrusive sound. As a general rule, carpet is better at absorbing noise than hard flooring. A very thick carpet with a very thick underlay can absorb as much as 70 per cent of ambient sound, but that is seldom the case and even at that level can leave a significant residue of noise. It’s not only what you’ve got, it’s how you use it. Space planning can play an essential role in creating a balanced acoustic environment. A well-designed layout will minimise sight lines and also group people sensibly. It will take account of trends such as higher occupation densities and accommodate for them. Specifying quiet work rooms and break out spaces can be essential (if properly monitored and managed) so that people can work in the right environment for the job in hand. A good designer will also use furniture, screens and partitions intelligently to provide the right balance of privacy and interaction. 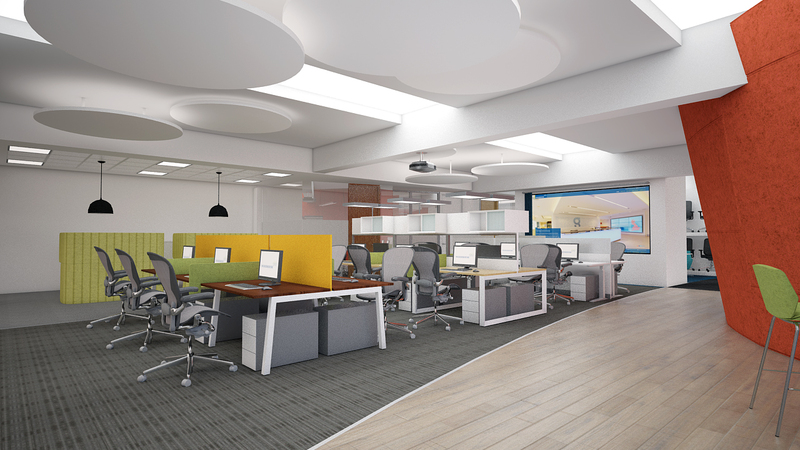 Design is becoming increasingly important as firms reduce the amount of space they allocate to people in the office. Certain organisations, like certain people, are inherently louder than others. In many cases, noise is important for creating a buzz and turning the workplace into a soundless crypt with people working in bubbles will be counterproductive. So it’s important that the physical environment you create is a true reflection of your culture and that your goal should always been to get rid of irrelevant noise. By Mark Dowse|2019-02-11T13:50:09+01:00February 11th, 2019|Uncategorised|Comments Off on Some sound advice on office acoustics!